Robert Moog’s death on August 21, 2005 overshadowed Luc Ferrari’s passing the very next day. (Ferrari was born February 5, 1929 in Paris. He died of pneumonia in Arezzo, Italy.) Often with audio, American media outlets celebrated the instrument-maker’s accomplishments. Ferrari’s departure went largely unnoticed. I won’t speculate about which man was the more influential. It’s enough to mention that a small and zealous lot are lamenting the French composer’s passing. I’m not alone in my admiration for the electroacoustic classic Presque rien no. 1 ou Le lever du jour au bord de la mer (1967-70; Musidisc MU 245172). This brilliant sound picture of daybreak on a beach redefined electroacoustic music by shining bright light on the medium’s potential. The orchestral triptych, Histoire du plaisir et de la désolation, is another favorite. (For more, see below.) The following four relatively recent discs show the late septuagenarian’s activities. 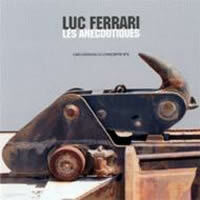 Luc FERRARI: Les Anecdotiques: Exploitation de [sic] Concepts No. 6 (The Anecdotals: Exploitation of Concepts No. 6) (2001-02). Sub Rosa SR207 (http://www.subrosa.net/). 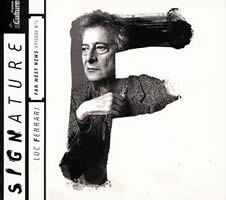 Luc FERRARI: Far-West News Episode No. 1 (1999); Histoire du plaisir et de la désolation (1979-81). Nouvel Orchestre de France, Michaël Luig (cond.). Signature 11014 (http://www.radiofrance.fr/). Les Anecdotiques’ 15 connected tracks spread a poetic travelogue across the listener’s horizon. Tape recorder in hand, Luc and Brunhild Meyer Ferrari captured sounds during travels in Europe and the US between June 2001 and July 2002. Each track fancifully documents a particular place. The composer calls them “sound riddles.” Over a ground populated with gently dressed natural sounds, Ferrari casually spatters processed noises amidst French and English banter. There are countless front-and-center interruptions: laughter, animals, slamming doors. Musical instruments are kept to a minimum. Remarkably, the 54 minutes pass with negligible progress, development, catharsis or recapitulation. Vastly unlike Presque rien no. 1 or the dance suite Patajaslocha (1984; Musidisc MU 291302), a representative work with instruments, there is neither forward motion nor Ferrari’s characteristic humor. Absent narrative and buffoonery, Les Anecdotiques might seem dull had musique-concrète’s master not delved deep into his kit, effortlessly blending inconsequential conversation, churning machines, ocean noises, muffled women’s voices, the sounds of farm animals, and light electronic twittering. Some samples straddle sequences, such as Ferrari’s “OK,” and most obviously, “numéro quatro” from the first sequence, set in Spain. The last second’s crunching bang reappears at the work’s beginning. The sweeping panorama disturbs in a way I can’t quite pinpoint, like an afternoon nap spoiled by a ringing phone one may well have imagined. Les Anecdotiques possess more verisimilitude than most other Ferrari works that employ deceptions in order to tease. It’s as if Ferrari doesn’t quite trust his memory. Questioning his own conjuring skills, he reverts to the enigmatic simplicity of crashing waves, passing traffic, bellowing cattle and ambling conversation. In September 1998, bringing their recording equipment with them, the Ferraris visited the American Southwest. Far-West News sets up as a foreign-correspondent report, but most of the sounds concern the mechanics of travel: car and train noises, asking for directions, procuring food and meals (the work opens in a supermarket where the Ferraris met composer David Dunn). There are some visits to tourist sites, a steam train and spoken Navaho, but beyond the introductory remarks and some speakers’ accents, it would be hard to pinpoint the locations’ uniqueness. Compared to Les Anecdotiques, these are arid tracks. However, there is a narrative: The recordings span seven days in September 1998. We’re teased with USA Today’s September 14 headlines (analysis of the Starr report and the buzz surrounding President Clinton’s possible impeachment). The composer’s voiceover functions apologetically rather than offering reassurance. It’s amusing to hear the Ferraris order deli sandwiches. Perhaps he is saying Episode 1 is the best he could do. While a cosmopolitan Parisian might not take well to Arizona — the Ferraris are experienced travelers — it’s entirely possible that Ferrari decided to represent the American Southwest in a distanced, disinterested fashion. The sonorous bare-octave opening of the orchestral Histoire du plaisir et de la désolation works as a curative after Far-West News’ laid-back montage. Happily reissued from ADDA 581156, Histoire is one of Ferrari’s best, winning him the Prix International Serge et Olga Koussevitzky in 1990. In three movements (“Harmonie du Diable,” “Plaisir – désir,” “Ronde de la désolation”), Ferrari’s percussion-heavy orchestration makes a grand yet enigmatic symphonic statement. “Harmonie du Diable” and “Plaisir – désir” begin statically, holding a chord or repeating a gesture. The stasis yields to a dance-like build-up, as in “Plaisir – désir,” which surrenders to overwhelming tom-toms. There are absurd interruptions: a tonic-dominant oompah (possibly suggesting the funeral march of Mahler’s First); later clarinets and contrabasses caricature Beethoven’s Eighth. Springing from some abortive Boulez-like gestures (which lose all gallantry in Ferrari’s hands), “Ronde de la désolation” settles onto a calm cadential pattern before succumbing to interruptions. This final movement includes subtle riffs on the Dies Irae, and astute ears will catch gestures from the piano collection, Journal intime, Comme une Fantaisie dite des Réminiscences (Montaigne MO 782110). 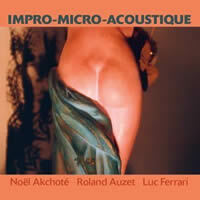 Noël AKCHOTÉ / Roland AUZET / Luc FERRARI: Impro-Micro-Acoustique. Five improvisations recorded and mixed by Christophe Hauser, 2001. Blue Chopsticks BC12 (http://www.dragcity.com/products?filter_label=BC). 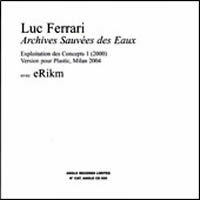 Luc FERRARI / eRikm: Archives Sauvées des Eaux: Exploitation des Concepts 1 (2000; version pour Plastic, Milan, Feb. 26, 2004). Angle Records Limited Angle CD 008 (http://www.audioglobe.it/). Is Ferrari’s real-time work a bold step into new territory or a mere grab for attention? Ferrari will be remembered for his studio work, over which he exerted control. In collaborative improvisation, the sum is not always greater than its parts. There are egos and techniques that must be blended. Rarely does everybody have good days. Impro-Micro-Acoustique chronicles Ferrari’s first attempt as improviser. Some of his scripted works of the 1960s and ’70s, such as the Tautologos series, encourage performers to find their own way. He keeps to the sidelines. Here Ferrari returns to the piano (he played professionally in the ’50s) performing with “objects” alongside guitarist Akchoté and percussionist Auzet. Five tracks (“Sur le contraste,” “Sur la pulsation,” “Sur le continu,” “Sur le minimum,” “Sur le rhythme”) are the result. At some level the titles are interchangeable: Pulse, rhythm and repetition are presumed elements of any improv, especially these. There are few surprises. Akchoté’s guitar doesn’t always sound like a guitar and Auzet’s percussion centers on contact. The piano appears sporadically, sometimes prepared. Despite the amplification and infrequent samples (touch-tone telephone blips, etc.) there’s little that couldn’t have been heard in the 1970s. It’s disheartening that “Sur le rhythme” has a fairly regular beat. It’s similarly disheartening to hear C3PO’s voice. Perhaps a child dragged a toy into the studio. An aura of fragility informs the project, as if a sneeze would oblige them to start over, reluctantly. Knowing that Ferrari took part, I expected a clever transformation, maybe a track overwhelmed by crickets. No such luck. If there’s humor, I missed it. Defective Star Wars toys are not amusing. However, there are points, in “Sur le contraste” especially, where some humor would have relieved the self-important mood. Even the devoted Ferrari fan will find little of interest. I can’t imagine this as required listening for anybody else. Archives Sauvées des Eaux redeems Impro-Micro-Acoustique. The source material is a collection of ancient recordings Ferrari rescued from water damage. It’s unclear what he and eRikm are doing in their February 26, 2004, Milan concert. Unlike Impro-Micro-Acoustique, Ferrari supplied two CDs packed with original material. Much of the processing, especially the looped areas suggesting a beat, I attribute to eRikm’s finessing. Six tracks flow with a happy inevitability. Some surge into monstrous salvos; others tinker contentedly with the remarkably varied material. There are clanging echoes suggestive of Programme Commun and Presque rien no. 1’s delicate bleeping. Of course there are muffled women’s voices (after Les Anecdotiques and Far-West News it’s easy to identify Brunhild Meyer Ferrari), cooing birds and delicate electronic washes. The spectral range also impresses, from booming rumbles to atmospheric clattering. Most welcome is the Godfather of irreverent allusions, the most famous of Beethoven quotes, four notes in C minor, cleverly followed by what I have to characterize as a looped snip from a Morricone spaghetti-western score, leading to something completely different. There’s no attempt at sound riddles or Les Anecdotiques and Far-West News’ horspiel. This disc documents the joys of playing about with interesting sounds. Ferrari — with eRikm’s help — took a firm but brief step into the 21st century. Sub Rosa, Blue Chopsticks and Angle Records can be found at good independent CD retailers specializing in contemporary classical and / or electroacoustic music. Online you can try Forced Exposure (http://www.forcedexposure.com/), Mimaroglu Music Sales (http://www.mimaroglumusicsales.com/), Twisted Village (http://www.twistedvillage.com/) or Verge (http://www.vergemusic.com/). The 2002 Signature disc may already be o/p. It might be worth pestering producer Radio France directly. It’s also the only digipak-style product I’ve seen that remains shut with a magnet. Otherwise Amazon.fr (http://www.amazon.fr/), Fnac.com (http://www.fnac.com/), Universal.fr (http://www.universalmusic.fr/) or Alapage.com (http://www.alapage.com/) would be good places to track it down.